LA Speed Garage - The Forum for Southern California Car and Motorcycle Enthusiasts! After I sold the new owner the light weight "bigs and skinnies" on 15"s, he disappeared. Not sure what that means. Sinking feeling he crashed it, blew it up somehow or lost it. I guess I would really rather not know the true outcome. So I will just try an let it go. I tracked the kid that bought Piggie for a while, and then had to turn it loose. And then a year later he emailed some stupid questions. Then I really turned it loose. 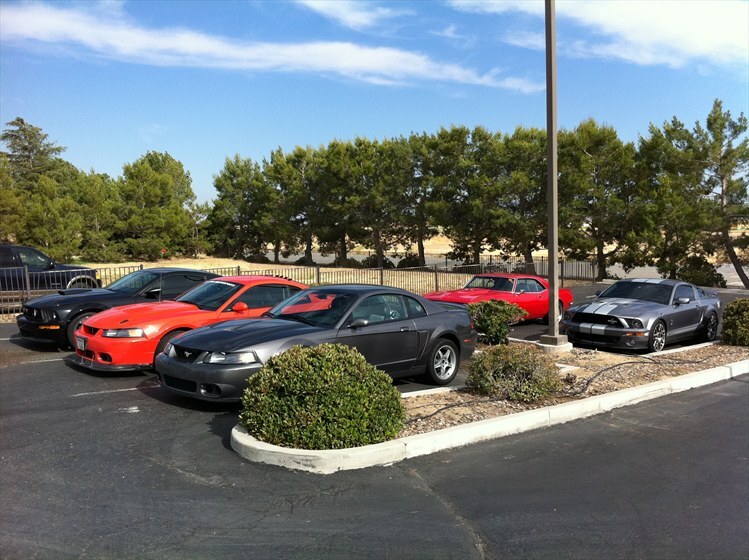 How many cars in this picture still have the same owner? So Jay killed the track scene for you guys eh? PS where is the Casita build thread as I'm assuming it got continued after SoCal Terminators died? If that's Ronnie's grey GT500, I'm pretty sure he still has it. I think Carlos still has his orange beast as well. Chad-1stgen wrote: Whats up people!? What are your current toys? Still the 68 Camaro. Sold the boat. Technically still have my two wheeler (2001 Harley softail) but its not much of a toy as it is a daily driver/commuter. Though the wife and I did ride motorcycles up the West Coast from Santa Monica to Portland OR. We were going to come down the spine of the sierras but she crashed her bike (came away almost unhurt thank goodness).